It's the first of its kind in 30 years. Boom. Amateur astronomers have spotted an exploding star in a galaxy not far from Earth. 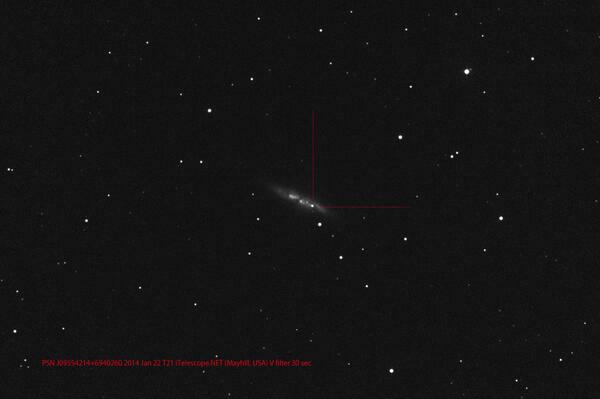 A new exploding star was just found in M82, practically next door in astronomical scales! A possible supernova was reported by amateur astronomers from Russia on 22 January and confirmed by multiple sources later that day. It's a type 1a supernova, a type of dying star that help astronomers to measure distances in the universe. It's the closest supernova of its kind in 30 years, so astronomers are getting pretty excited about it. Exploding stars are common, nearly 50 stars blow up every second! However, the vastness of the Universe means they are rarely close to us. 55 emails sent in an hour about one exploding star. That is how important this is! Why is this new #supernova in M82 exciting? Closest since 1987. Type we use to study dark energy. Binocular-visible. Might get neutrinos. The star resides in M82, a starburst galaxy nearly 12 million light years from Earth. Which technically means it exploded 12 million years ago, and we're just seeing it happen now. The supernova is in the constellation Ursa Major, also known as the Great Bear. If you have decent binoculars, you should be able to see it now. Here's where to look. "In two weeks when it is near its brightest and the moon is not up, even a small cheap pair of binoculars will be able to see it," says Tucker. This timelapse of a similar exploding star in 2012 shows how quickly the new supernova will brighten. Observing this [supernova] could help us better understand the more distant ones, and potentially shed light on the mystery of what's causing the expansion of the universe to speed up. The earlier we can observe a supernova, the more clues we get. This really could be a game changer. Which is good news for science, but bad news for astronomers who had plans this weekend. A new type Ia supernova in M82 means I won&#39;t sleep until the weekend. So much work, so much excitement. A new type Ia supernova in M82 means I won't sleep until the weekend. So much work, so much excitement.